AZL is continuing the release of the Big Boys. These are coal fired Big Boys with all new road numbers. They come in a set with tender and brown, wood side class CA-1 caboose. The caboose is all brass and highly detailed. This is a limited edition release. All road numbers are very limited in quantity. 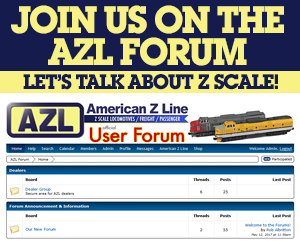 AZL has released all new TTX flat cars with M577 personnel carriers. The M577s are by Z-Panzer. They are highly detailed and appear in sand yellow. This is a limited edition release. Four road numbers are available.